Bandai Namco has now confirmed the worldwide release date for their upcoming action game, Code Vein, which will be releasing worldwide on PlayStation 4, Xbox One, and PC on September 28. Following the announcement of the Japanese release date of Code Vein, Bandai Namco Entertainment followed up confirming the western launch. Code Vein, which was first officially revealed in April 2017 and appeared for a brief blink-and-you-missed-it moment at Microsoft's E3 conference later that year, is an anime take on FromSoft's Souls games by way of Being Human. Check out a new trailer, the Collector's Edition and pre-order bonuses below. In the not too distant future, a mysterious disaster has brought collapse to the world as we know it. 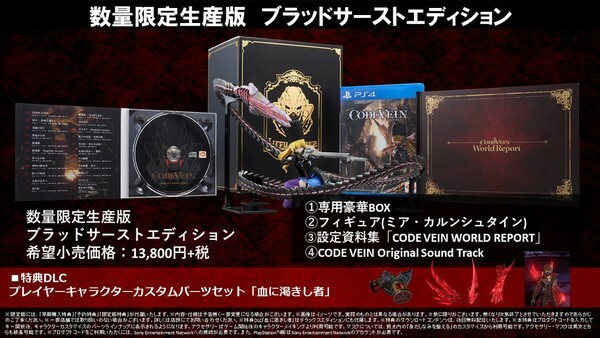 The pre-order weapons, meanwhile, include the aforementioned God Eater crossover items, as well as the blood veil Venous Claw and Accessory Set; bundling communication stamps for multiplayer, customisation elements for a unique look, and a blood code named Harbinger that offers the player special characteristics. At the center of the destruction lies a hidden society of Revenants called Vein. It comes with a collector's box, a 17 cm tall Mia Karnstein figurine, the original soundtrack, an artbook, and a code for the "Insatiable Bloodthirst" customization set. Give into the bloodlust fully and risk becoming one of the Lost, fi endish ghouls devoid of any remaining humanity.